The Savvy Stamper: Happy Valentine's Day! Happy Valentine's day! Be sure to give the ones you love an extra hug today:) We've all been hit with some nasty bug here, so while we are on the mend, we will be celebrating our Valentines when we all feel a little better! 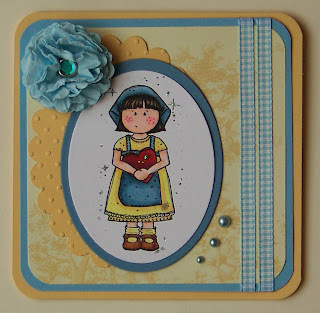 But here is a little card to share with you using another lovely Stamping Boutique image. I thought I'd go out on a limb and use a different color scheme (for me anyway) and I really love how it turned out! I found this scrap of pretty toile DP in my scrap box and everything fell into place. I love it when that happens! The Stamping Boutique is sponsoring this week's Sunday Sketch and Stash Challenge. The theme is to either follow their sketch, or create a card with no corners. Be sure to play if you can to win some freebies! Supplies are SU cardstock in So Saffron, Bashful Blue, and Brocade Blue. Ribbon is SU also. Image is Stamping Boutique Audrey with a Heart colored in with Copic markers and accented with Stickles. Pearls are Kaiser. I also used oval Nesties, a corner rounder and Cuttlebug Swiss Dots embossing folder. Flower is handmade using a scalloped circle punch, crimper, and a jeweled brad. Colleen- perfect color pallet to compliment your image, love what you have done! Colleen, I love the cheery yellow & the flower is FABULOUS!! I so want to try that!! Adorable! Love the image and that yellow rocks! Love the colour combination! Your flower is yummy too!